Police investigating the death of a 10-year-old boy in County Antrim believe he may have been attacked by the family's German Shepherd dog. 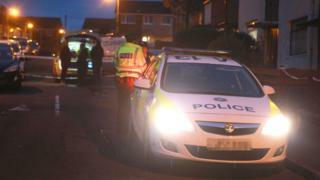 Paramedics were called to a house on Queen's Avenue in Glengormley at 12:00 BST on Sunday. The ambulance service said the boy had lacerations and was taken to the Royal Belfast Hospital for Sick Children. A post-mortem examination was completed on Monday and further forensic tests are to be carried out. A-38-year-old man who had been helping police with their inquiries was released on Monday night. A neighbour said she heard loud noises coming from the house minutes before emergency services arrived at the scene. A boy, bloodied and heavily bandaged, was later taken to an ambulance, she added. Forensic officers carried out an investigation inside the house through until Sunday night and police cordoned off the area around it. SDLP councillor Noreen McClelland said people in the area had been left deeply shocked after the "absolute tragedy" in what is a "quiet and tight-knit community". "There are no words to describe the horror in this community - people are just devastated," she added. "My thoughts and prayers are with the child's family and friends at this horrendous time. "I know that people will rally around them to offer their support."